This image, posted on Facebook, shows empty shelves at the Springhill Walmart store after a run on meat and other food products Saturday night. MANSFIELD, LA (KSLA) - Shelves in Walmart stores in Springhill and Mansfield, LA were reportedly cleared Saturday night, when the stores allowed purchases on EBT cards even though they were not showing limits. "Just about everything is gone, I've never seen it in that condition," said Mansfield Walmart customer Anthony Fuller. Walmart employees could still be seen putting food from the carts away as late as Sunday afternoon. "I was just thinking, I'm so glad my mom doesn't work here [Walmart] anymore, that's the only thing I could think about, those employees working, that would have to restock all that stuff," said O.J Evans who took cell phone video of the overflowing shopping carts at the Mansfield Walmart. Evans believes it was natural human reaction that led people to fill up their carts during the glitch, but Walmart shoppers Stan and Judy Garcia feel very differently. "That's plain theft, that's stealing that's all I got to say about it," said Garcia. Lynd says contrary to rumors, nobody was unruly or arrested and they were mainly there to help prevent shoplifting and theft. A dispatcher for Mansfield police also confirms officers were called in for crowd control at the Mansfield Walmart. 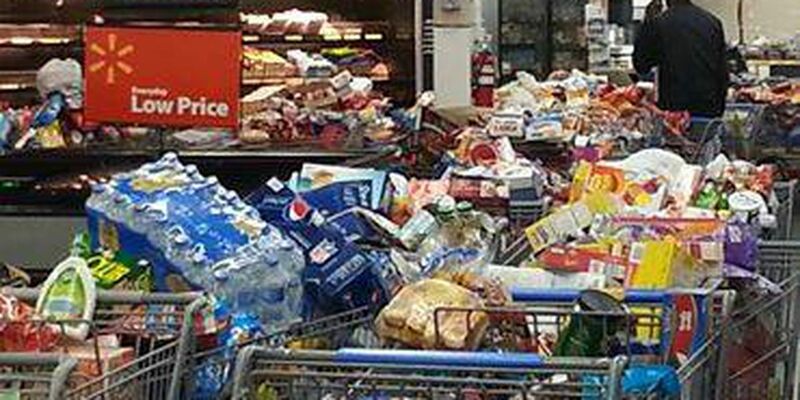 She said the shelves were cleared out, forcing Walmart to stop selling food at 9 p.m. There were no arrests. There was, however, a huge mess left behind. Pictures and videos obtained by KSLA News 12 show aisles packed with shoppers emptying the shelves in Springhill. Another video shows what appear to be at least dozens of overflowing carts left abandoned in the aisles at the Mansfield store, against the backdrop of emptied shelves in the meat department. It all happened at the end of a day in which the EBT system went down in several states, including Louisiana. Xerox, a vendor for the EBT system, experienced a power outage while conducting a routine backup test in one of the company's locations. While the system was back up Saturday night, it appears that it was not functioning entirely properly in some areas. Kayla Whaling, a spokesperson for Walmart, tells KSLA News 12 that the company was "fully engaged and monitoring the situation and transactions during the outage." "We did make the decision to continue to accept EBT cards (and purchases on WIC and SNAP) during the outage so that they could get food for their families." Asked whether Walmart would be taking the loss on any food purchased on the cards that did not show limits, or on the perishable food left behind in carts, Whaling would only say that "we monitored transactions during the outage." A spokesperson for the Louisiana Department of Children and Family Services says they take all allegations of potential fraud seriously, they are aware of the reports and they will be investigating. "While transactional systems maintained by DCFS contractors may have been impacted by today's outage, the systems that DCFS uses to track EBT card usage and identify fraud were still in place. DCFS vigorously investigates all fraud claims. Anyone suspected of fraudulently using public assistance benefits are investigated and prosecuted to the full extent of the law. The public is encouraged to report cases of suspected SNAP fraud by calling the DCFS toll-free hotline at 1-888-LAHELP-U and selecting option 7 from the main menu or by visiting www.dcfs.la.gov/ReportFraud."